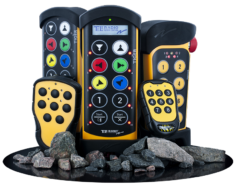 Safety Industrial Radio Remote Controls – Ravioli S.p.A.
We have been designing and manufacturing Ravioli safety industrial Radio Remote Controls for over 20 years. Since 2014 Ravioli is also official partner and exclusive dealer in Italy of Radio Remote Controls produced by Tele Radio, a successful Swedish Company since 1955 in this industry. The common goal of Ravioli and Tele Radio is to work side by side to satisfy their customers’ needs, providing the best cutting edge technical solutions combined with a fast service. Thanks to the experience both Companies have acquired in the radio remote controls industry along the years and thanks to the know-how and competence of our team, we are able to suggest standard executions or to design and project customised products for any specific application you might require, fully according to the current Norms and Regulations. All our Radio Remote Controls are studied to be applied in heavy circumstances, characterised by the presence of dust, extreme temperatures and corrosive materials such as acids and oils. Since the beginning, we pay a very deep attention to safety. We are therefore able to take into consideration and properly judge with you the application area and the machineries to be radio controlled, providing you with the most appropriate safety and working frequency for your needs.